So a top Boko Haram leader was seen face to face, and there was no bombing, no kidnapping and no killing. Court judge, lawyers and others present caught a glimpse of one of the most wanted terrorists, and in the end, no one died. Well, Khalid al-Barnawi has not repented, he only appeared in court on Tuesday in Abuja for various accusations. Khalid al-Barnawi, one of three Nigerians listed by the US government as a "specially designated global terrorist", appeared alongside six other defendants, including his second wife. All pleaded not guilty and all seven were remanded in custody until a further hearing on April 11. The charges relate to the abduction and murder of foreign workers in Nigeria between 2011 and 2013, including Italian engineer, Franco Lamolinara and his British colleague, Chris McManus. Both were killed by their captors in the northern city of Sokoto just moments after the start of a joint British-Nigerian rescue operation at the compound where they were being held. Barnawi is also accused of kidnapping Frenchman, Francis Collomp and German national, Edgar Raupach. Collomp was kidnapped in December 2012 and held by Ansaru for nearly a year before he managed to stage a dramatic escape in November 2013. Raupach's abduction was initially claimed by Al-Qaeda in the Islamic Maghreb to which Ansaru has been linked. He was killed during a military raid in Kano, northern Nigeria, in May 2012. The other kidnapping and murder charges relate to seven foreign nationals -- two from Lebanon, two Syrians, an Italian, a Greek and a Briton -- who were seized in the northern state of Bauchi in 2013. Ansaru also claimed responsibility for the kidnapping. According to the charge sheet, the seven were taken to the Sambisa Forest area of Borno state, in northeastern Nigeria, and held for about 10 days before they were killed. They were then buried in a shallow grave, the charge read. Halima Haliru, Barnawi's second wife, faces only one charge -- failing to disclose information about acts of terrorism. 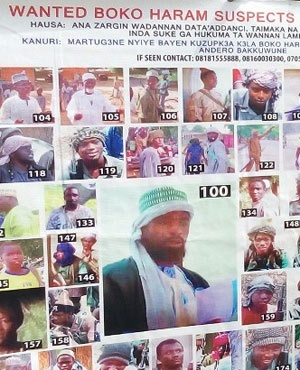 Nigeria's military announced in April last year that Barnawi was arrested in the capital of Kogi state, in central Nigeria, and described him as "on top of the list of our wanted terrorists". The group, also known as Jamaatu Ansarul Muslimina Fi Biladissudan ("Vanguard for the Aid of Muslims in Black Africa"), specialised in high-profile killings and attacks on foreigners.